Do you want to create best mobile responsive websites in WordPress? 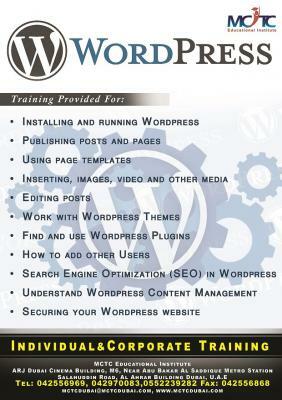 WordPress can be used to create a standard website for business or personal use. Why WordPress is popular today? 	Themes allow you to change the design of your website quickly. 	Responsive Web design and many more!!! MCTC Dubai, a leading computer training center in Dubai offers professional practical-oriented quality training for WordPress from the expert instructors all over the UAE. Free demo is available. We promise you the best training in Dubai that will help you to get direct entry to IT industry. Whether you are a beginner to web development or an expert, we can make you expert in WordPress easily. Affordable fees, flexible class timings, expert full-time trainers and individual sessions. Enroll with us to improve your career prospects from the experts!